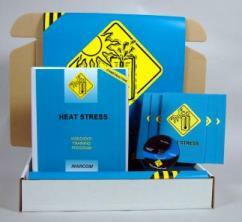 MARCOM's Heat Stress in Construction Environments Construction Safety Kit reviews how heat affects the body, the steps that employees can take to prevent heat stress, and elementary first aid that can be given to a worker who has been affected by a heat-related illness. Each year thousands of employees suffer the adverse effects of heat stress. Whether they work outdoors under the hot summer sun, or indoors with equipment and machinery that give off high levels of heat, these employees need to know how to recognize and prevent heat stress and other heat-related health problems. Materials in the kit include a DVD program, five motivational posters, and 30 employee booklets. The posters encourage employees to work safely and avoid injuries. The DVD program and employee booklets include information on situations leading to heat-related illnesses, heat stress, heat exhaustion and heat stroke, how the body reacts to heat, recognizing symptoms of heat stress, preventing heat-related illnesses, first aid, and more. The DVD program in the kit comes with a comprehensive leader's guide, reproducible scheduling & attendance form, employee quiz, training certificate and training log.